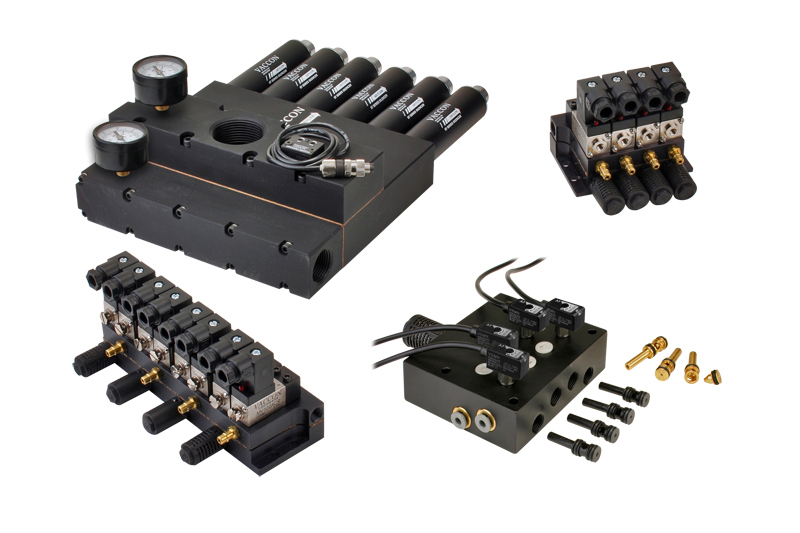 All Fixed Length Vacuum Manifolds and modules are designed and manufactured to meet specific customer application requirements for new or existing equipment. VMF manifolds offer designers the freedom and flexibility to create the most efficient and economic vacuum manifold system to meet their automation environment. In many applications a variety of pneumatic components such as venturi vacuum cartridges, solenoid valves, check valves, vacuum switches, pressure regulators and ball valves are combined to make a complete pneumatic circuit offering both vacuum and pressure. Vaccon engineers are experts at designing modules that are compact, energy efficient, fast acting and easy-to-install. Whether it’s an inkjet printer, automotive End-of-Arm tool, nitrogen tire filling module, IC handler or inflation/deflation module for an RV, Vaccon has the most powerful and reliable vacuum solution. All manifolds are made of anodized aluminum unless otherwise requested.